The past week saw a fantastic treat for aurora watchers. Generally it is the southern part of the country, Tasmania in particular, that sees the most impressive displays. 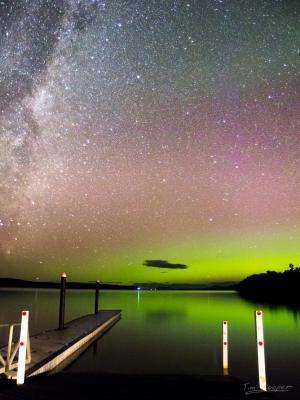 But this aurora has been so intense that it was even seen across New South Wales and up around Brisbane it added a red glow to the sky. The activity was caused by a sunspot designated AR2297 and it has been crossing the face of the sun for the past fortnight. On March 6 (AEDT), before the sunspot had even come into view, it had produced a number of M-class flares. Solar flares are ranked into three categories of intensity: X-class flares are the strongest; M-class are moderate; and C-class are the mildest. That these early flares were registered as moderate ones, even though they weren't yet turned towards Earth, suggests that their true intensity was likely much greater. 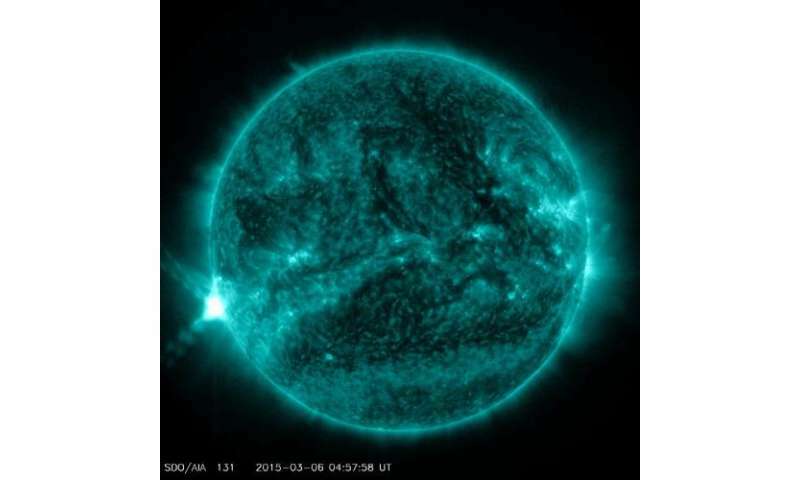 During the early hours of March 12 (AEDT), the sunspot produced an X2-class flare. All this activity had caused giant bubbles of gas to be blown off the sun. Called coronal mass ejections (CMEs), a number of them were expected to hit Earth around March 13. Surprisingly when a stunning outburst of aurora did occur over the Arctic Circle on March 14 – a little later than expected – it wasn't due to the CMEs. As reported by spaceweather.com, these aurora occurred because the interplanetary magnetic field (IMF) around Earth tipped south, creating a crack in the Earth's magnetic field. The solar wind was able to flow through this opening and interacted with the Earth's atmosphere to trigger the display. But there was still more to come. On March 15, another CME was ejected from the sun as seen in this movie by NASA's Solar and Heliospheric Observatory (SOHO). This eruption impacted Earth's magnetic field on March 17 at approximately 3:30pm (AEDT) and by that evening had set off the strongest geomagnetic storm of the current solar cycle (designated Solar Cycle 24, it began in 2008 and will continue through until 2021). The peak of activity lasted for more than nine hours, not only causing the aurora australis to drift north, but the aurora borealis (the Northern Lights) was seen as far south as Kansas and Virginia. It certainly was fantastic for all who saw this event. Unfortunately the weather in Melbourne was completely overcast, so I can only wait until next time.